The Stork Craft Hoop Glider and Ottoman in white or espresso with beige cushion comes with generous seating room. It features padded arms and the arm cushions have a pocket for paper, magazines, and TV remote. A must-have for new moms, this Hoop Glider is perfect for rocking baby to sleep in the wee hours of the night. 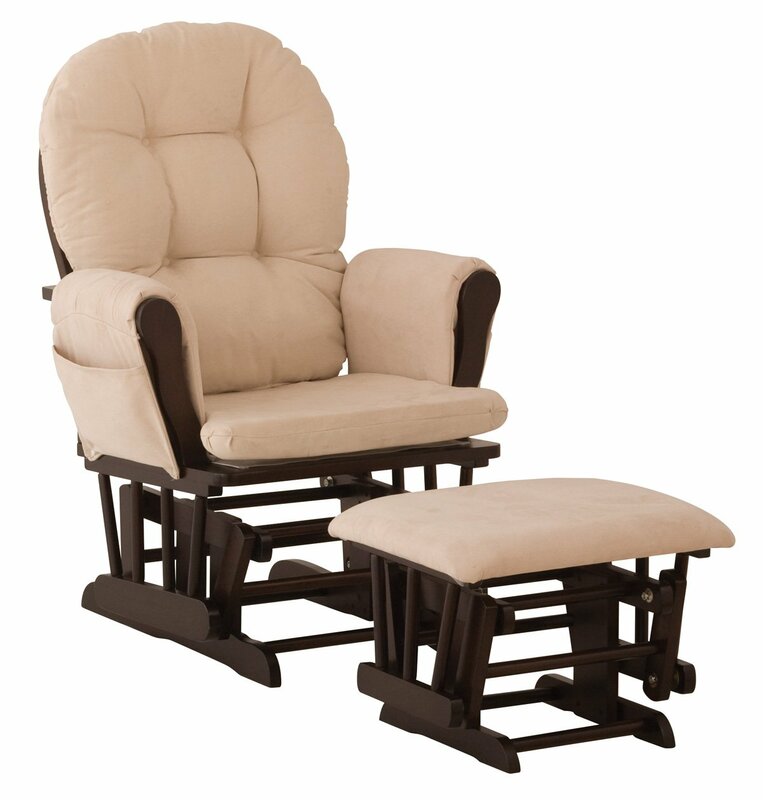 Glider features solid wood construction with metal, enclosed ball bearings for a smooth gliding motion. Handcrafted from select hardwoods, this stylish glider features thickly padded seat cushions and arms for additional comfort and a oversize seating area. A steel encased ball bearing mechanism ensures a smooth, quiet and relaxing glide motion. This Shermag glider can be adjusted and locked in multiple positions for additional comfort and enjoyment. Your baby deserves the best. Your child’s safety is our greatest concern. Stork Craft and other brands strives to exceed your expectations in the areas of safety, performance, usability and style. See all Stork Craft products meet or exceed domestic and international regulatory standards for juvenile furniture safety and performance, and are carefully designed to mitigate the risks of potential hazards to your child. This is the ultimate glider and ottoman combination for any room in your house!